Spring has sprung and it’s the perfect time to get rid of dust, clutter, and unhealthy habits. It’s time to do some Spring Cleaning for Your Health! Spring and Cleaning just go together. The longer, warmer days provide the perfect opportunity to do some of the chores/changes you may have been putting off. Women’s Cancer & Surgical Care has some tips for tidying up your mind, body, and soul. Overall health depends on all three of these areas and studies show that one can definitely be affected by the other. 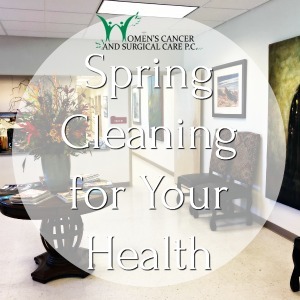 Let us help you get started on Spring Cleaning for Your Health! Clear the Clutter ~ Getting rid of things you don’t use anymore is good for your home and your mind. Plus it can go to someone who really needs it. Happy Helper ~ While you’re dropping off your donations, ask if they need any help. Or find another place to volunteer. Learn a Lot ~ Keep your mind sharp by learning a new skill, reading a new book, or doing a new activity. Move More ~ Even a walk around the neighborhood is better than nothing. Just get moving. Fresh Food ~ Stick to the perimeter of the grocery store: fresh vegetables and fruits, beans and nuts, and lean protein. Soothe Stress ~ Find what relaxes you, and do it. High stress is linked to negative effects on health. Gratitude & Grace ~ Be grateful for what you have and be gracious about what you don’t. Laugh a Lot ~ Laughter really is the best medicine. Try to do it as often as possible. Nurture with Nature ~ Spring is the perfect time to be outside enjoying the beauty of nature. It truly is good for your soul. Don’t let this season pass you by without doing some Spring Cleaning for Your Health! This entry was posted in General, WCSC Latest Highlights. Bookmark the permalink.